with migraines, depression, anxiety, crohn's disease, epilepsy, cluster headaches, IBS and fibromyalgia. The ablation of the Auricular Branch of the Vagus Nerve has extremely successful in providing substantially reduced or in many cases, total elimination of migraines for thousands of people. The Auricular Branch of the Vegas Nerve runs through the Crus of Helix of the ear. A nerve is basically a "telephone line" that delivers messages throughout our body. If there is a message that we do not want delivered, we can stop it by "cutting" that telephone line (ablation of that nerve). 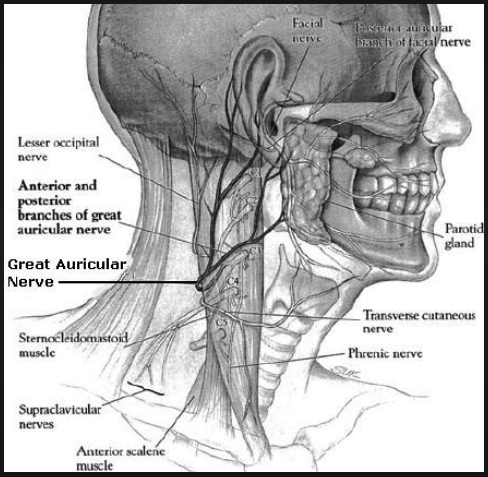 In this case, the nerve endings of the Auricular Branch of the Vagus Nerve are severed. The ablation is done on the same side in which the migraines occur. Those individuals that get migraines on both sides of the ear, usually ablate both Auricular Nerve Branches. 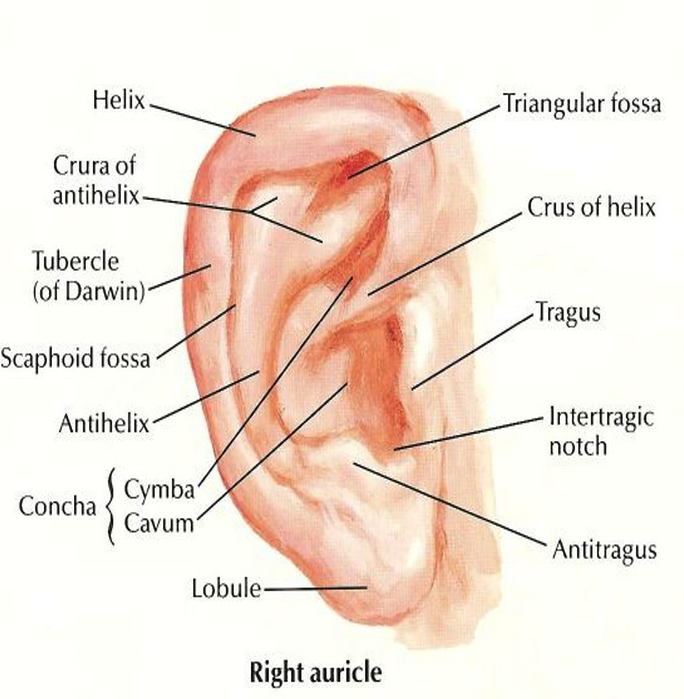 The piercing of the Crus of Helix in one ear. Local anesthetic if desired. Aftercare cleaning solution. the very basic Titanium rings to those with Swarovski Crystals and 14 kt gold. We will also help change out your earring after your ear heals to a different style of earring. We are extremely careful to use ONLY 100% pure titanium or 14kt gold earrings. causing complications and delay in the healing process. Earrings are priced separately and are not included in the cost of the procedure. This procedure is performed by a medical doctor. Opals, CZ's, High Polish Titanium. Each earring is priced separately. Prices start at $30. 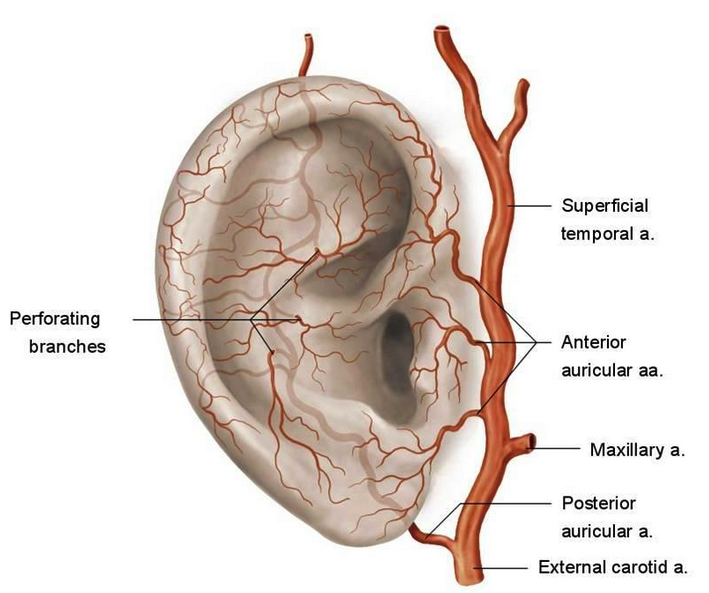 The Auricular Branch of the Vagus Nerve lies inside the Crus of the Helix of the ear. You can see this nerve's location on the head and ear anatomy above. The basis behind this treatment is the same as it is for hyperhydrosis, neurectomy with Trigeminal Neuralgia and other pathologies that occur because of transmission of "messages". Whether the "messages" be pain or sweating. If these paths are ablated (meaning the nerve is damaged), the pain signals are disrupted so that the "message" does not reach the brains sensory cortex. Currently, there is no cure for the migraine: thus the reason for countless migraine clinics and treatment drugs. Most people have found very little success in these routes, leaving them to search out alternative methods to alleviate their pain. 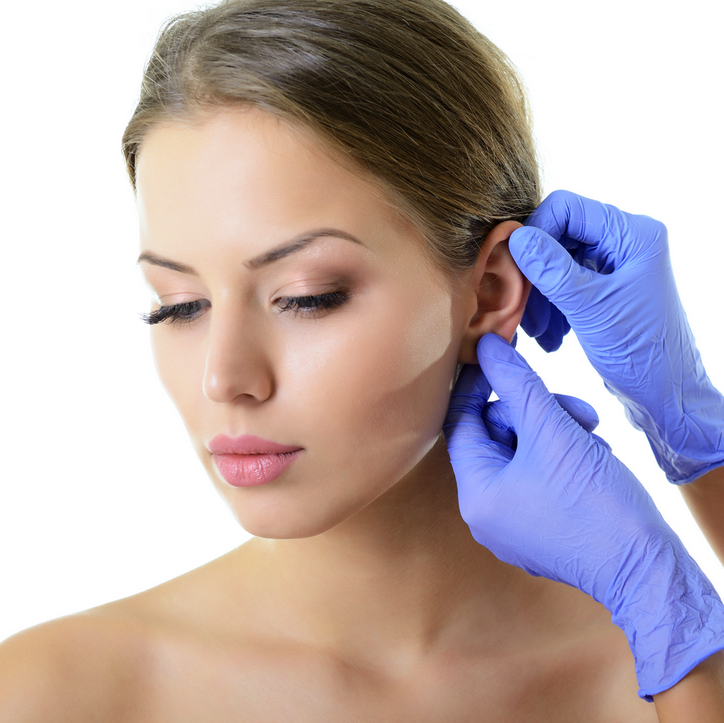 The Auricular Ablation is one of the most well-known alternative methods. In this procedure, it stands to reason, that if the Auricular Branch of the Vagus is one of the nerves transmitting these "messages" of pain, then ablating this nerve should disrupt the transmission of its "message". It has also been found that stimulation of the Vagus Nerve has improved not only migraines, but depression and many other serious diseases. Migraine research continues to be an ongoing process in the medical field. There is no "scientific" evidence as to why this ablation procedure seems to work, but the evidence clearly points that it does. There are many medical treatments performed today as well as throughout history that have no "scientific" evidence to back them up, they are done simply because they seem to work in many cases. This is based on the biostat term: "p-value" . The "p-value" is considered significant when large numbers results are available. There have been thousands of individuals that have received this piercing, the majority experienced reduction or complete elimination of migraines. This means that the "p-value" is significant - that the results are far more than just a coincidence. It is important to remember, that Just as with all treatments in medicine, there is no guarantee of success with any one person. Because of the existing evidence of success in the reduction or elimination of migraine pain with this piercing, many medical clinics in Europe and in the US now strictly specialize in this procedure. In addition to helping patients with their migraine pain, these clinics offer a much safer environment. An environment that insures aseptic conditions and sterile instruments, a significant decrease in the chance of infection and the elimination of exposure to dangerous, transmittable diseases, such as Hepatitis or HIV. The procedure is performed by a medical doctor, which also means that a patient can receive a local anesthetic to make the entire procedure painless, if they so desire. The worst that can happen is that the procedure simply does not work and the patient gets pretty earrings, the greatest thing is that it helps reduce or eliminate their pain - the sole purpose of this procedure. If this alternative method works, even partially, it not only means a tremendous improvement in the quality of life, but a tremendous savings of money because it will eliminate the need for continual doctors visits and ongoing medications or Botox®. 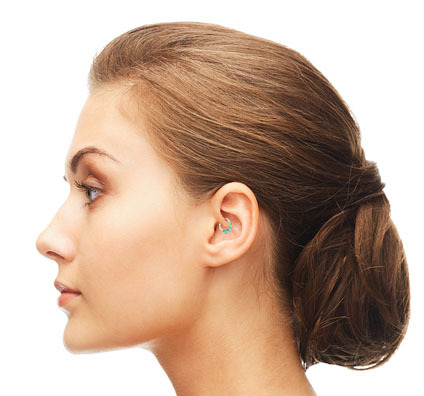 The Auricular Ablation is done by piercing through the Auricular Nerve in the Crus of Helix of the ear. 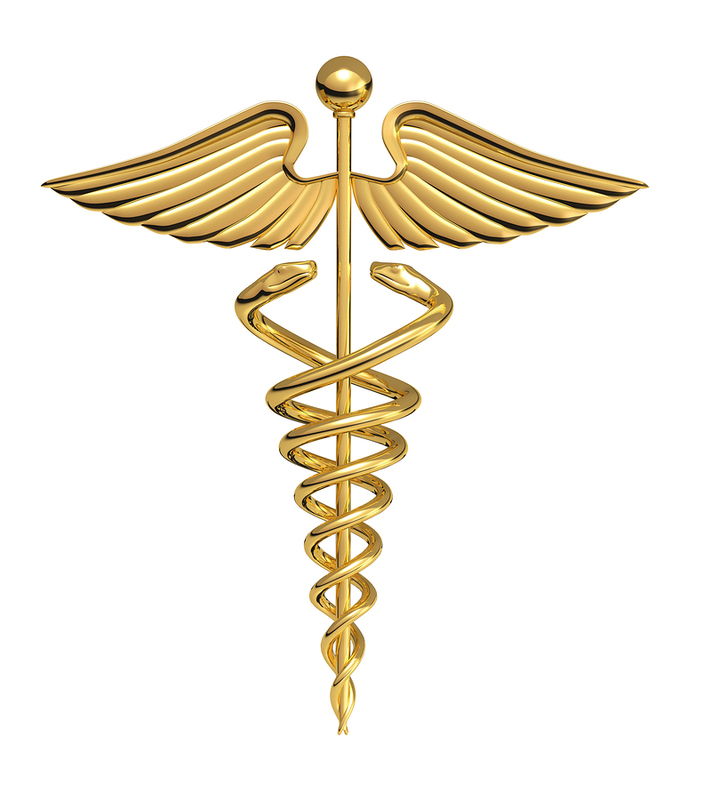 The procedure is performed by our doctors in our medical offices. Patient's have the option of choosing whether to use local anesthetic or none at all. There is no additional cost for the anesthetic. We also provide the surgical wound aftercare solution at no extra charge. Earrings are priced separately and are not included in the cost of the procedure. Total healing time is from 4 to 6 months.